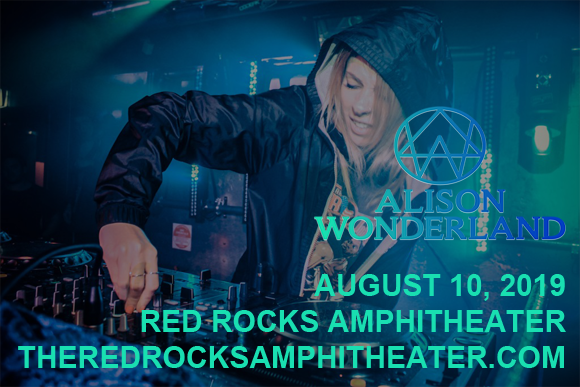 One of the hottest names in EDM, Aussie DJ and producer Alison Wonderland performs her first headlining show at Red Rocks Amphitheater on Saturday 10th August 2019! The chart-topping artist will be dropping some serious beats, and will be joining in support by the incredible line-up of EKALI, Medasin and Wuki! Get ready for some euphoric dancefloor moments as Wonderland gets the party rocking! Australian EDM producer, DJ, and singer Alison Wonderland began her career as a classically trained cellist, before developing an interest in electronic dance music. She released her debut EP, Calm Down, in 2014, which peaked at 38 on the ARIA chart and launched the singles "I Want U" and "Cold". Her 2015 single "U Don't Know," featuring Wayne Coyne from the Flaming Lips, brought her music to an international audience and her debut album, Run, was released later that year, peaking at number six on the ARIA Albums Chart and gaining gold certification from ARIA. She followed with the 2018 album Awake, which debuted at number one on Billboard's Top Dance/Electronic Albums Chart. Wonderland was listed at No. 96 on DJ Mag's Top 100 DJs in October 2018 and is the highest billed female DJ in Coachella history.